Posted by Equestrian Queensland on 07/09/2018. Regarding Dressage Rule 1.15.3.2 and the subsequent restriction on horses graded Novice pre 1/1/17 being able to compete officially at Preliminary level. The EADC considers that there has been sufficient interim time between the introduction of the changes to the Grading Points on 1/1/17 for this restriction to have served its purpose, and that those Novice level horses no longer need this limitation on competition. 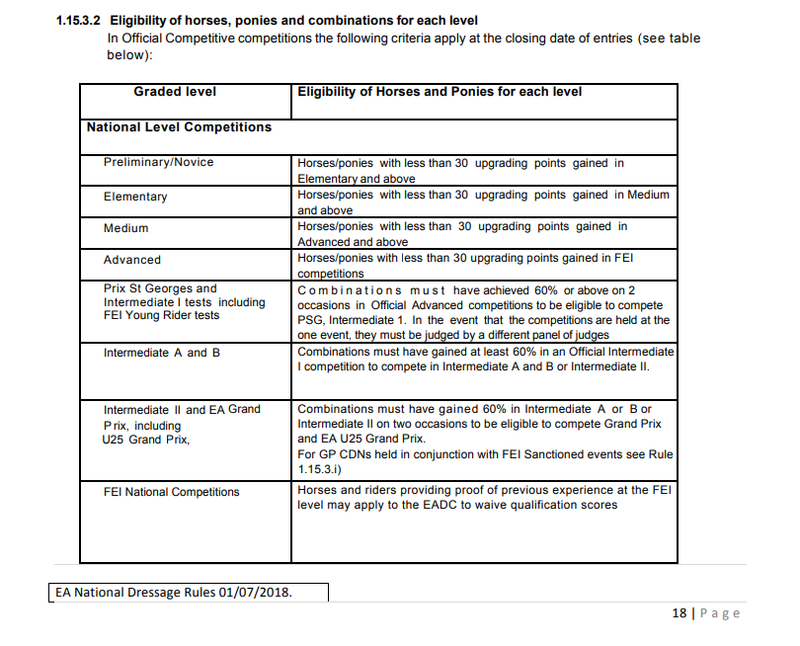 With this in mind, all horses having accrued less than 30 points in Elementary (40 points as from 1/1/19), are eligible to compete at Preliminary/Novice level regardless of previous points accrued prior to 1/1/17.